Millions lack faith to receive answers to their prayers - to free their minds from fears and worries. 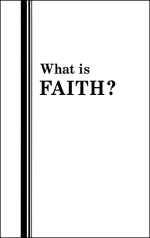 To a large extent this is due to lack of understanding what faith is. Read this simple but thorough explanation of the subject. HE WHOLE WORLD is now shaking with convulsions, preparatory to a tremendous event. This present world breakdown, following the two greatest, most destructive wars in history, with world economic collapse, social unrest, religious confusion, is merely the WARNING SIGNAL that the END of the present civilization is here. The second coming of Christ to establish a new order of world peace on earth is near - much nearer than people think!